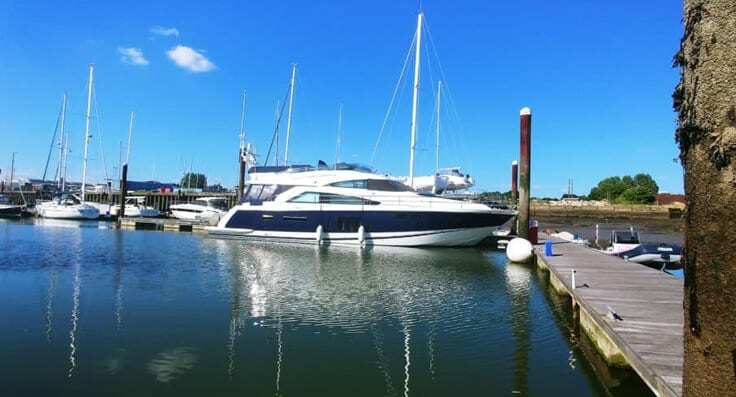 Luxury Skippered Motor Yacht charters in 2012 air conditioned Fairline Squadron 58 MY for up to 12 guests (6 overnight) based in Swanwick Marina on the River Hamble. Solent, Jurassic Coast, Channel Islands and Northern France. Bespoke itineraries to meet your requirements. Fully licensed. 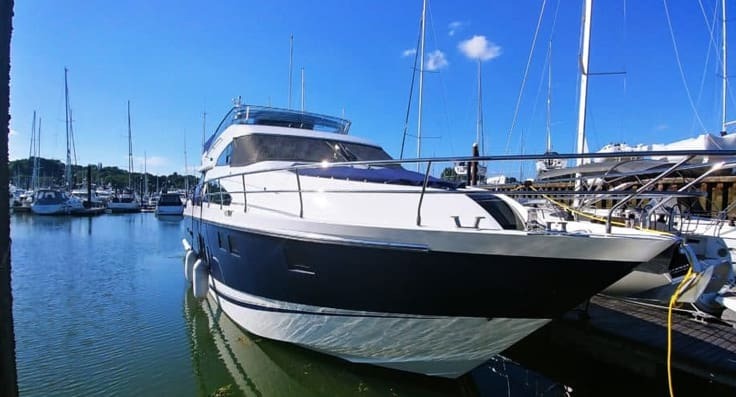 Pure Liberty is a 58 ft flybridge motor yacht. The salon which links to the cockpit has two separate seating areas (one with foldable dining table) and the galley. In Salon there is also a bespoke B&O TV and entertainment system. On the lower deck in addition to the ensuite master cabin there are a VIP double and twin cabin which share a toilet compartment with separate shower. All cabins have TVs. The flybridge has extensive seating and dining areas, a large sheltered sun bed in front of the helm and its own sound system. If required an enormous bimini can be erected to provide extensive shade. The wet bar comprises an icemaker, fridge, electric griddle and sink. There is a separate crew cabin in the stern which could be used by a young child. The salon and cabins all benefit from tropical air conditioning which when required will also heat the Yacht. Being MCA Cat 2 coded and Maritime Labour Convention compliant Pure Liberty can sail any where within 60 miles of a safe haven, making cross channel trips possible. All safety gear is modern and fully serviced. Pure Liberty has powerful radar and the latest AIS transponder so ships know where she is and we know where ships are. Maintenance is carried out by qualified experienced professionals and we only use Skippers we are happy to go out with ourselves. With a full alcohol license we can serve whatever selection of refreshments you chose. Safety is and always will be our first priority. We aim to ensure you have a wonderful memorable time with us but we will never knowingly compromise your safety, the safety of our crew, other water users and the Yacht. Being a member of the PCA we can team up with our fellow members to cater for larger parties. Perhaps with another motor yacht or a rib. Please call for further information. If you live locally or are visiting the area we would be pleased to show you over Pure Liberty. We know you will be impressed.